Multidose sterile pharmaceutical products are prone to contamination, both from environmental and corporeal flora. 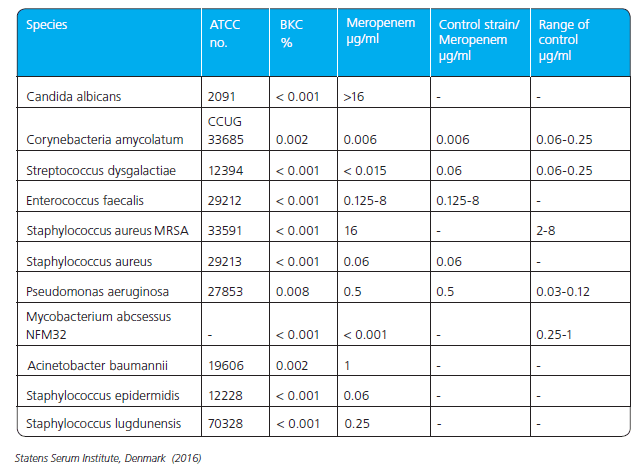 Microbial contamination can present a threat to the safety, the purity or the efficacy of nasal products, hence the importance of utilizing an effective preservative. For formulations coming into contact with mucosal tissue, it is necessary to preserve against ontamination by utilizing only the purest and safest ingredients. In both human and veterinary nasal formulations, one of the most common and effective preservatives is Benzalkonium Chloride (BKC / BAK). Our FeF™ benzalkonium Chloride is widely used as an excipient in nasal sprays, drops and ointments, where its concentration typically varies from 0.005% up to 0.2%. length distribution, whether it is with our standard chain length or with customized chain length distributions. 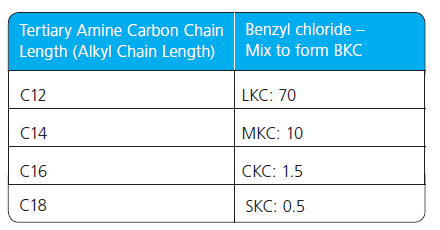 Our standard chain length distribution in Benzalkonium Chloride is approx. 65% C12 and 35% C14, with max. 5% of C16. We also offer other chain length distribution products or can develop your own, customized product. Compatibility: Mixing BKC with ordinary soaps and/or with anionic detergents may decrease the activity. As Quats are cationic compounds, they should not be mixed with anionic compounds which would have a neutralizing effect. Quats can be inhibited by Tween™ and by lecithin. Avoid mixing Benzalkonium Chloride (BKC) with citrates, iodides, nitrates, perman-ganates, salicylates, silver salts and tartrates. Incompatibilities have also been reported with other substances including aluminium, fluorescin sodium, hydrogen peroxide, kaolin and some sulfonamides.